I started out playing Forza with the original, back then I was more interested in drifting and constantly drifted down Fujimi Kaido(Which at the time is similar to the Old Down Hill). I didn't play much Forza 2 because of the lack of Fujimi, didn't really interest me as much. I began playing Forza much more when FM3 came out specifically when they launched Fujimi Kaido(specifically the New Down Hill), They sold me at the preview from Team Blackjack. Because of the lack of public lobbies and knowing many people that played Forza 3, I resorted to drifting down the New Down Hill. Eventually drifting the same track over and over started to bore me, so I just began to push myself to go faster, get closer to the guardrails, basically trying to be Takumi. I did this all through Forza 3's lifespan. Enter Forza 4 and the return of Public lobbies, now with P2P lobbies. I jumped right into the mix constantly running the downhill in public lobbies. My main cars back then were a SW20, 190E, and a Gen 1 Miata. I very quickly decided that I was going to make a team, being creative, I named it "Project D". Pretty early on I met up with FitDeez and Prodrift who also had a team named "Project D". I began playing and chatting with these guys along with other Project D members Island89, Smooth92, and NinjaHusker for quite a while. The last few runs we did were on the Old Down Hill, I was chasing FitDeez in his EG6, where in the last corner I chose a line for more exit speed compared to the normal line taken. Because of this, it ended up being an all out side by side duel to the finish. I ended up just nosing him out by about 4 feet. He responded with an Invitation to Project D.
This was a great group of guys to team with, Everyone was around the same level all running about 4.46s-4.48s which for the time was very fast. Even the fastest people from around this time were only doing about 4.42s-4.44s. I remember around this time meeting some of the JST guys such as Grave and Deadman. This was a very different time in the touge world, All teams of the time (Project D, JST, 99GT, KKTR, TGP) kept to themselves, occasionally meeting in public lobbies but didn't really talk much. However, this lead to all the times wanting to be the fastest, team battles happened frequently. It had a very Initial D feel the way teams acted back then. One night in a public lobby with the Project D crew, we came across a few other pretty fast racers at time, one in particular was hitting 4.38s which was about 1-2seconds faster than anyone else we had met at the time. After a few hours there was some talk about making a new team, we had decided to leave behind the Project D name and merge with them. Garage Kaido was born. This is where I improved greatly, we had a bunch of team lobbies up constantly practicing lines and stuff, and since we were all similar skilled, we pushed each other to faster times. Soon most of us were below the 4.40 mark, with my main car as a EG6 hitting 4.38s. We ended up dominating the public lobbies, with some of us consistently hitting 4.38s which was about 1-2secs ahead of the majority. Like I had stated before, this is the time period where teams didn't really talk to each other, however our team leader decided to mock any teams/drivers we beat. This would be Felon as we all know. At the time, we didn't know the true nature of Felon, and most of us on Garage K didn't know he was always sending messages trash talking others. Because of his constant trash talk, any Garage K members would be kicked out of lobbies hosted by the other big name teams at the time. We rarely were able to stay in any lobby for long without being booted so we mainly stayed in our own private lobbies. The drivers in Garage K, including me, were aggravated about constantly being booted, at the time we thought because we were slightly faster. This only motivated us to get faster and faster, and in turn I because very good friends with my fellow Garage K members. Soon, we had several members hitting 4.36s including Felon, Fuzzybear, Prodrift, and Myself along new additions to the team KraZe and Wilson. These were the fastest times then, beating the majority of others only hitting about 4.40s with only some of the faster guys hitting 4.38s. Going into public lobbies, everyone seemed to know of us and I remember hearing "Oh Sh*t, its GarageK" several times. It wasn't until later that we had learned what we were known for, Arrogance, Thanks to felon. Out of nowhere, Felon disappeared, leaving Wilson and myself to run Garage K. With the lack of felon, all of the teams started to become more friendly to GarK, we weren't kicked anymore and overall the community seemed to be coming together. This is when the Touge Battle Network was born and helped to bring the community even closer together with many meets and competitions including the most successful one, Touge Wars. After talking and playing all sorts of games with my teammates, these guys became some of my best friends. We all would talk either on Xbox live, Touge Battle Network, and even texted a good few. One of the guys I talked the most with was FuzzyBear. Fuzzy was only mentioned briefly in my recap so far but in my opinion, he was the fastest on Fujimi Kaido. Many times we would just be talking in party chat all the while he reclaimed the #1 (In the world) leaderboard time on 5 or 6 stages of Fujimi within 2 hours or so. He was crazy fast and incredibly consistent. On a particular day in mid/late 2012, I was livestreaming myself recreating a drift/touge paint that would take me several hours and listening to some chill music since it felt weirdly like an off day. Moments after I took a brief break from streaming, Levin called me. There was a long pause before he said anything but eventually said "Anthony passed away." Due to how close Anthony lived to me, I did have an opportunity to attend the funeral however I felt that Saturday was much better spent holding an event in his honor on the mountain that he loved. That morning at 8am, a parade of cars drove slowly and silently down Fujimi Kaido all wearing a heart sticker with the words "In Memory of Anthony Fuzzybear Mitchell" It was amazing to see the community come together in such as way it had never before. Fuzzybear had the #1 spot in all of Point to Point section, which averages adds up the best times from all P2P tracks in all classes of cars (176 different sections total) and he stood above the rest. Up until 2 years after his passing did he finally get bumped from 1st. Even now, nearly 4 years later, he remains in 3rd overall in the world. Rest in peace Ant! After 5 rounds, the finalists were Koolaid, Beta, and Myself. We each battled each other leaving Beta ranking 3rd with 0-2, Koolaid 2nd with 1-1, and myself with 2-0. It should have ended here but some of the spectators watching said we should do another run between me and Koolaid. I agreed and ended up losing that battle, which put us at 1 win each. After that 2nd battle, posts about Koolaid winning already were up. Being that I was the only judge, I felt any defending or any complaints about the last race would make me look bad, so I just took my loss and left it as it. Me and Koolaid have talked about it several times since and both classify it as a tie. Before Touge Wars had begun, 4.36 was still the fastest time set, but it had been reach by several others such as Koolaid (Gen1), Beta(AE86), and Edward(Z32). Wilson and I happened to be working with the MR-S and spent hotlapping it. In a matter of about a week, Wilson broke into the 35s, then 34s, then finally ending with a 33.9. It was incredible for the time but he didn't tell many except a few other Garage K members. Using a MR-S with the help from Wilson I set to work practicing, one of my first 35s was in a big lobby (collisions off) where it caught a bunch of attention. This continued right after Touge Wars was finished, it was a mad dash to the fastest times. Some of the other drivers began pushing into the 35s range also. I was the next one behind Wilson to break into the 34s. Soon followed by Koolaid, Beta, KraZe, and Edward. The same several who were able to hit 34s slowly made their way into the 33 club also. At the time, that was thought to be the limit. After reaching 33s, we returned back to our normal public lobbies and friendly battles. 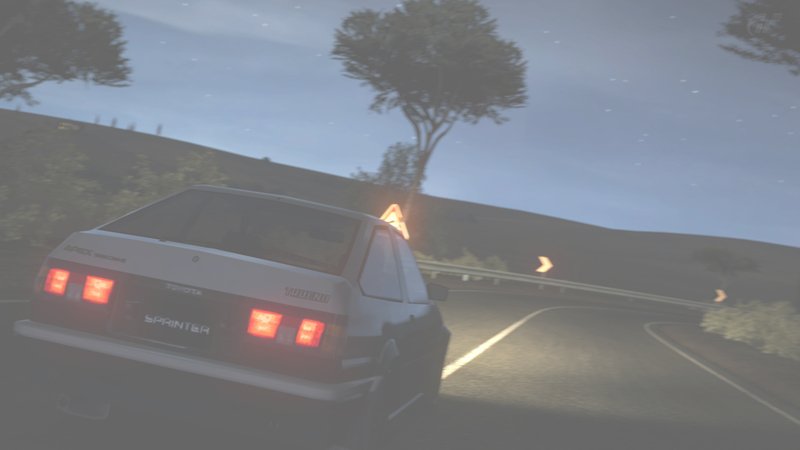 Many times I would livestream the public lobbies or competitions, trying to show off Touge as much as possible because it isn't very well known. In doing so, I would gain a few viewers and try to invite them when I could. One guy in particular was very much interested in touge after running it a few times and jumped right into the community. Very quickly he improved his time the low 40s and even was going to tryout for GTxS (99GT with a new name). For having only been running touge for about 2 to 3 weeks he was able to hit a 4.39 and 4.40 on his tryout runs. GTxS however denied him, which was a stupid move, his 4.39 puts him faster than half of their members. Although he wasn't as respected because he was just starting out, he deserved to get on a team...so I invited him to GarK. Welcome Kona to the team. Garage Kaido's leader was technically Felon, however in his several month absence Wilson and myself ran the team. Slowly but surely we were repairing the image of Garage K until Felon unexpectedly reappeared. It didn't take long for him to start returning to his old ways, only this time he wasn't the fastest anymore. Wilson and I had decided to have a talk with him, explaining that we would like to keep our newly repaired image and can't have him running his mouth. He immediately left and began telling some members that Wilson and I wanted them off the team. It was the last straw of drama, Wilson and I promptly left Garage Kaido, some other members joined us in leaving. Thus, Street Version was born. Street Version was essentially a group of friends that had all been racing together for some time. It included Wilson, KraZe, Smooth, Prodrift, Kona, Myself, and a newly added Avanti. Here at StV, we have always been about attitude over speed, If you were able to mesh well with the rest of us and got along with everyone as well as having the drive to get better, then you would get invited. The same core group that former StV when it was created is the same core group in it today. Even those who don't play Forza anymore and have moved on other things are still part of the Street Version family. After all the hot lapping for the 33s, we were stale and just wanted to race public lobbies and friendly battles. There may have been some competitions/etc, but there wasn't any major progress in hitting times lower than 33s. Enter once again Kona. He was determined to keep up with the veterans and spent hours hot lapping and improving his lines and technique. Soon the numbers started to fall. At first 35s, then he broke into 34s, then 33s. He had a knack for sitting down with a car and just driving it until he got the time he wanted. When he was on the verge of 32s, I took up the challenge and began to race him to be the first ever driver to get a 4.32. We both spent hours trying to achieve this and ultimately I was successful. Once I had that title I sat back and waited as Kona continued to hot lap (or Konalap) just waiting to see what times he could do. In amazement Kona had reached into the 31s, soon followed by KraZe and myself. However, when the dust settled, Kona had hit his current record of a 4.30.9 which was barely imaginable at that point... and still is... years later. Since that time the community faded away slightly, mainly because were still on Forza 4 because Fujimi Kaido didn't return to Forza 5, and doesn't look like it will be in 6. The Horizon series also hasn't provided us with any technical mountain passes. The community isn't dead though, there still are touge racers that frequent the public lobbies. I only bumped into NorwayDude a few months ago, surprised I had never seen him before because of his great times hitting 33s and 32s. After a few days of racing with him and other StV members, he was promptly invited. That pretty much brings us up to date as of late 2015, where we continue to push the limits of Forza 4 touge. We will continue on doing so, waiting and hoping, for next console game to have a decent mountain to race on. Forza's InFocus Article that showcased the "Drift Union" video, had a bit of an interview with them, so here is that article. Ever wondered what would happen if one of the best Forza 4 touge teams tried their hands at making a drift video? After taking a look at this video by team Street Version, I think you’ll be very impressed by the results and the marrying of these two motorsport disciplines! "A bit about myself, I am MiNdChArGeR but usually just go by ‘MiNd’, I have been playing Forza off and on since it came out the first Forza came out, but at the time I played alot of competitive Halo. I did play Forza often but the real hook for me was when Forza 3 came out with new Fujimi Kaido New Hill track. I did love and spend much time on the Old side of the hill, but the New side idealized what I thought a good Touge track would be. (Kind of like something out of Initial D!) My Biggest draw to the Forza series is ‘Fujimi Kaido’, no other up-to-date racing simulator has a good Mountain Pass/Touge Track. As I was and still very much an ‘Initial D’ fan, I would just constantly race and practice, and it was very fun and entertaining. “When Forza 4 released, the new custom public lobbies got me even more hooked into Forza, as I would just constantly roam the Point-to-Point lobbies. Also at the release, I had bought a HD Capture card off my friend. Not long before I had been searching for any videos on YouTube showing any Touge races in Forza 4, but not very much was found....so I decided it would be my mission to upload as much Touge related content as I could! “Moving on...this video started while throwing around ideas for a new site, as Wilson, Smooth92, and myself were starting up something called ‘Touge Union.’ We would just be talking about ideas while racing and drifting, and during some of those drift sessions we actually were doing very well, especially for us who don't really practice. So after a few good drift sessions, we were set on making a video. “The main inspiration came from the actual Drift Union, for those who don't know, the Drift Union is a drift crew up from Canada that has 3 members, they drive a purple Subaru Legacy, purple Rx7 FC, and a purple Toyota Soarer. We just by chance happened to pick out 2/3rds of the Drift Union cars, which sparked the idea to paint them purple and become the virtual Drift Union! We tried to get the Purple look as close to theirs as possible, along with the rims which were very similar if not exact. We really went all out trying to make it look very close in looks as well as their style. On many of their videos the actual Drift Union might tap a wall or each other, lose a bumper, scrape a wall or two, but key to their videos was them trying to get very close to each other in tandem and just having a great time doing it whilst not stressing about damaging cars etc. This mindset was very similar to how we would get clips for the video, We would just drift, try to tandem as close as we can, probably scrape each other, knock off bumpers, with Smooth laughing and calling me names jokingly when I wouldn't let him transition. We really just went out to have fun and messed around laughing most of the time and afterwards I checked out the replays. I guess It could have gone wrong if we didn't get enough clips but....luckily we happened to get the perfect amount! “As far as putting the video together, I tried to stay away from all the default replay cameras, focusing on more realistic camera angles such as cockpit, on board, or hood view. The other part of editing that surprisingly took a while was just selecting the music. Ever since I made videos back in Windows Movie Maker for Gran Turismo, There wasn't much capability to make fancy effects in videos, and many other video makers just made the video flow with the music and if it lined up very good, it was a good video. That was the approach I had taken from back in those days, which was that I didn't need fancy effects and cool transitions to make a good video, as long as I can get the video to flow with the music then it had potential to come out good. For this video in particular, I think I had tried editing it with a different song, then completely restarting with a different one...twice. Once I had picked the current song, it seemed to all piece together just how I wanted it. “Special Thanks and shoutouts to Turn 10 for the feature, Drift Union for being awesome, the community over at the Touge Union, and all of my great friends on Street Version! 4:35.4 with the MR-S eh? When I get back on FM4 I guess I'll have to dethrone that car as the fastest street car on the New Downhill "You better watch out, you better not cry..."
A while ago Kingkuff used a MR2, Haven't seen him use it recently but for the team pics I wanted to use variety of cars. Yeah, On the New downhill I pulled away, but on the old downhill we had some exciting runs, bumper to bumper across the finish line nearly everytime! We will have to race MR2's again sometime! Your video showed that your MR-S does 4:35.2? so which is it .2 or .4? The video is the fastest leaderboard time I have so far so go with the video time. We joined the beat kraze's time cult. Wilson ran the Mr-s faster again didn't he? Kraze and Koolaid will be happy to know that I just updated my time! Congratulations Mind, I'm gonna go cry in a corner now. Nice, are you the only 4? Well, there's you and "GeneralLeeBMX", I know you don't like the Lancia but it's still there . He doesn't even participate in the community though. Geez, you just keep getting better! Is that the fastest an MRS has ever set on the Downhill?